Children will be introduced to the book “Hop on Pop", a book written by famed author Dr. Seuss. After this lesson students will have worked on phonics initial and ending sounds, phonics short vowel sounds, and rhyming words. Do we recognize any words from this book? Have we seen any of these words from previous Dr. Seuss books? What theme do we see with Dr. Seuss and how he uses words? Hop and Pop rhyme…can you name two words that rhyme? Hop and Pop have the short -o- vowel sound, can you name two words with this short -o- vowel sound? Cat and Pat have short vowel –a- sounds, can you name two words with short vowel –a- sounds? Red and Bed have short vowel –e- sounds, can you name two words with short vowel –e- sounds? 3. 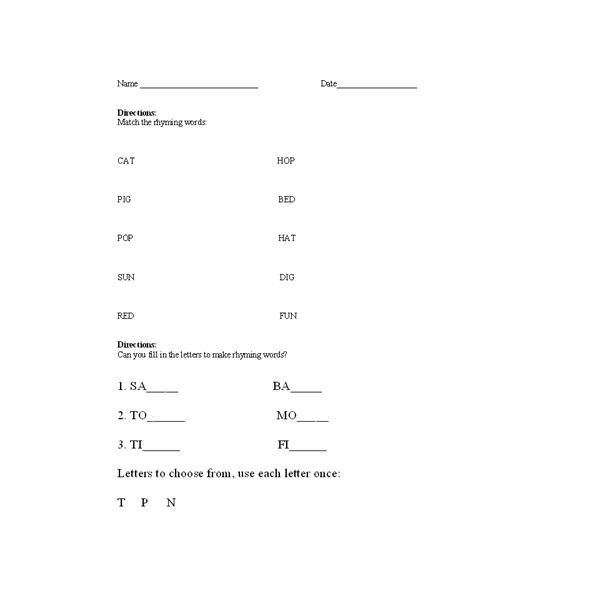 The students will now complete a short vowel worksheet which can be found here. Discuss how short vowel sounds were found in many of the words in the book, especially the title “Hop on Pop". This worksheet will help the children identify short vowels in various words including bed, pin, and apple. 4. Go over initial and ending sounds with the students. Explain how the rhyming words in the book have the same ending sounds such as Pop and Hop…these words both end in the letter P. Have children complete the phonics worksheet which helps to identify rhyming words ad final letter sounds. This worksheet is found below. After this lesson students will become more aware of short vowel sounds, final letter sounds, and rhyming words.